As its economic clout grows, Beijing is forging its own path in international relations. China is close to meeting all the measures of what defines a global great power: political, economic, and military might with a global reach. But it does not appear to act like a great power in terms of its contribution to international leadership during conflict situations such as in Ukraine. Instead we repeatedly only see Beijing being assertive when it comes to defending its own narrow interests. While Deng Xiaoping’s foreign policy dictum was for China to “hide its strength and bide its time” (taoguang yanghui), in January 2014 Chinese Communist Party General Secretary Xi Jinping announced that China should be “proactive” (fenfa you wei). This is the equivalent of China moving from first gear into second; and like second gear, the pace of this new foreign policy can sometimes be jagged. As the Russian intervention in citizen unrest in Ukraine has played out, Beijing has held back from criticizing Moscow, citing China’s long-standing policy of non-interference in the internal affairs of other states. While China decries the interference of “hostile foreign forces” in popular protests in Xinjiang and Tibet, it appears that it won’t take a public stance on Russia’s breach of Ukrainian sovereignty. In phone calls to U.S. President Barack Obama and German Chancellor Angela Merkel on March 10, Xi urged the two leaders to use political and diplomatic means to resolve the standoff. 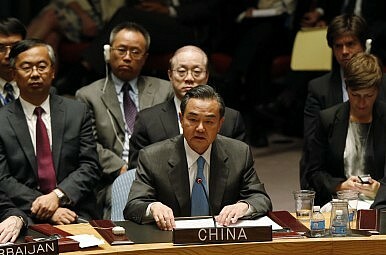 On March 15, China’s UN representative put forward a three-point proposal on a political solution to the crisis; urging the formation of an international group to help mediate; recommending all parties refrain from further provocation; and suggesting international financial actors should help stabilize Ukraine’s economic situation. Yet, China abstained from the UN draft resolution on the same day, which condemned today’s referendum aimed at legitimizing the transfer of the Crimea from Ukraine to Russia. As a leading power and permanent member of the UN Security Council, China has exercised its “right to speak” (huayu quan) on the situation in Ukraine, but is avoiding involvement in the international response. The 13 other members of the Security Council all voted in favor of the resolution, while Russia opposed it. In Chinese foreign policy terms Xi and his representative at the UN have been quite outspoken. But outside China, many would agree that China’s response is too little, too late. It is behavior such as this in times of international crisis that has led commentators to question whether or not China is a “reluctant stakeholder” in the global order and whether or not China is still just a regional power. Since becoming general secretary of the CCP in 2012, Xi Jinping has overseen an expansion of China’s economic reforms and opening up to the outside world, at the same time as leading a new clampdown on freedom of speech and association, and tightening security against Uighur and Tibetan populations. Under Xi’s leadership China has gone head to head with Japan on contested territory in the East China Sea, declared a new ADIZ over the contested Senkaku/Diaoyu islands, and been increasingly assertive in the South China Sea. China’s economic model requires new markets and privileged access to resources and this will be a moderating factor in their foreign policy approach. Beijing can’t afford to offend its neighbor Russia for a complex range of reasons, ranging from internal and external security and access to new sources of energy supply. The competitive and contentious external environment China faces in its immediate neighborhood requires Beijing to take a relatively cautious and tactful national security approach in the short to medium term. At the same time it is strengthening its external environment, especially on the periphery, whenever it can. So we can expect to see Chinese foreign policy verge from being at times assertive and proactive; to in other situations being ambiguous and non-confrontational. Where China cannot affect change, it makes the best out of the current global order and quietly pursues own interests; but where the possibility of creating new norms exists, Beijing acts assertively. In the 1990s, Chinese policymakers conducted in-depth studies on the lessons to be learned from the fall of the Soviet Union. In the 2000s they studied the rise and fall of other great powers such as Portugal, Spain, France, Germany, Great Britain—and the United States—and the lessons each held for China. This is why as a rising great power, despite this year’s 12.2 percent budget increase to the PLA, China is not likely to follow the U.S. or the Soviet Union in making burdensome investments in military spending. The PLA budget is only 2 percent of China’s GDP; versus the current U.S. figure of 4.4 percent and the Soviet Union’s figure of 13-14 percent just before the Gorbachev era began in the mid-1980s. China is instead investing in asymmetric warfare, focusing on electro-magnetic pulse weapons, cyber and space warfare, and a small but adequate nuclear deterrent; meanwhile creating a complex network of China-centered bilateral and multilateral agreements such as the Shanghai Cooperation Organization, free trade agreements with states such as Iceland, and less formalized, issue-specific partnerships with states strategically important to China such as Zimbabwe, Sri Lanka and Russia. China is a relatively insecure new great power, both in its internal politics and in terms of the external environment it faces. So it has to be both increasingly proactive about defending its interests and ambiguous about what its actual interests are in order to delay open conflict with other potential competitors for as long as possible. China is by no means a reluctant stakeholder; rather a reluctant leader. We should not expect China to behave as previous and present great powers have done; it is forging its own path in international relations and will need to resolve its own sense of insecurity before it responds as a true global leader might to a geopolitical crisis such as the one unfolding in Ukraine. Professor Anne-Marie Brady is a specialist on Chinese and polar politics based at the University of Canterbury, NZ and currently a Visiting Scholar at the Woodrow Wilson International Center for Scholars, Washington, DC.